Minister to present to cabinet his plan to sever all ties with Gaza, condition short-term aid on return of Israeli casualties and civilians. 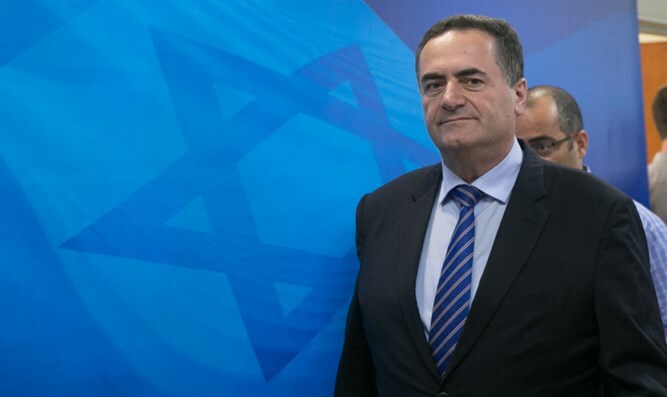 Cabinet member Minister of Transport and Intelligence Yisrael Katz addressed the cabinet meeting expected to convene today and discuss a political settlement in Gaza. "The situation in Gaza is nearing a decision. Either an arrangement, or a war," Katz said in a tweet. The minister said he intends to present in the cabinet an alternative to the plans on the table which would entail a “severing of all civil ties between Israel and Gaza,” and that he will “support any plan that includes laying Egyptian infrastructure on land and sea in favor of Gaza under international supervision," he said. "In the short term, all aid to Gaza must be conditioned on a clear outline for the return of the casualties and the prisoners," Katz emphasized. The political-security cabinet will meet Sunday afternoon to discuss efforts by UN envoy Nikolay Mladenov and Egyptian intelligence chief Abbas Kamel to reach a political settlement between Israel and the Palestinian Arabs on the Gaza border. According to Palestinian Arab reports, the Hamas terrorist organization has already expressed its willingness to accept the Egyptian arrangement, which includes a calming of tensions with Israel and the transfer of the administration of the Gaza Strip to the Palestinian Authority. This is a plan that, if approved by the cabinet, will be carried out in stages. In the first stage, after a complete cessation of balloon terrorism and any other type of firing from Gaza, the Rafah crossing will be opened regularly and crossings will be given easier access to Israel, while the fishing zone for Gaza fisherman will be widened. If the first stage is successful, then contacts will be held to return Israeli civilians and the bodies of soldiers held by Hamas, with the main move in exchange being to promote significant international projects for the population of Gaza.